The Honorable Raymond Mphakamisi Mhlaba (12 February 1920 – 20 February 2005) was an anti-apartheid activist and leader of the African National Congress (ANC) also as well the first premier of the Eastern Cape. Mhlaba spent 25 years of his life in prison. Well known for being sentenced, along with Nelson Mandela, Govan Mbeki, Walter Sisulu and others in the Rivonia Trial, he was an active member of the ANC and the South African Communist Party (SACP) all his adult life. His kindly manner brought him the nickname "Oom Ray". Apartheid was a system of institutionalised racial segregation that existed in South Africa from 1948 until the early 1990s. 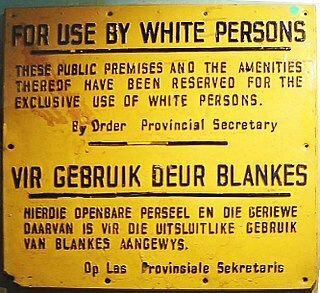 Apartheid was characterised by an authoritarian political culture based on baasskap, which encouraged state repression of Black African, Coloured, and Asian South Africans for the benefit of the nation's minority white population. The economic legacy and social effects of apartheid continue to the present day. The Premier of the Eastern Cape is the head of government of the Eastern Cape province of South Africa. Fort Beaufort is a town in the Amatole District of South Africa's Eastern Cape Province, and had a population of 25,668 in 2011. The town was established in 1837 and became a municipality in 1883. The town lies at the confluence of the Kat River and Brak River between the Keiskamma and Great Fish Rivers. Fort Beaufort serves as a mini-'dormitory' for academic staff and students of Fort Hare University, based in the nearby town of Alice, and is also close to sulphur springs. Schools in the area include the historic Healdtown Comprehensive School. The Eastern Cape is a province of South Africa. Its capital is Bhisho, but its two largest cities are Port Elizabeth and East London. It was formed in 1994 out of the Xhosa homelands or bantustans of Transkei and Ciskei, together with the eastern portion of the Cape Province. It is the landing place and home of the 1820 Settlers. The central and eastern part of the province is the traditional home of the Xhosa people. Port Elizabeth or The Bay is one of the major cities in South Africa; it is situated in the Eastern Cape Province, 770 km (478 mi) east of Cape Town. The city, often shortened to PE and nicknamed "The Windy City", stretches for 16 km along Algoa Bay, and is one of the major seaports in South Africa. Port Elizabeth is the southernmost large city on the African continent, just farther south than Cape Town. Port Elizabeth was founded as a town in 1820 to house British settlers as a way of strengthening the border region between the Cape Colony and the Xhosa. It now forms part of the Nelson Mandela Bay Metropolitan Municipality, which has a population of over 1.3 million. The South African Communist Party (SACP) is a communist party in South Africa. It was founded in 1921, was declared illegal in 1950 by the governing National Party, and participated in the struggle to end the apartheid system. It is a partner of the Tripartite Alliance with the African National Congress and the Congress of South African Trade Unions (COSATU) and through this it influences the South African government. Vuyisile Mini was a unionist, Umkhonto we Sizwe activist, singer and one of the first African National Congress members to be executed by apartheid South Africa. Umkhonto we Sizwe was the armed wing of the African National Congress (ANC), co-founded by Nelson Mandela in the wake of the Sharpeville massacre. Its mission was to fight against the South African government. Ahmed Mohamed Kathrada, sometimes known by the nickname "Kathy", was a South African politician, political prisoner and anti-apartheid activist. The Rivonia Trial took place in South Africa between 9 October 1963 and 12 June 1964. The Rivonia Trial led to the imprisonment of Nelson Mandela and the others among the accused who were convicted of sabotage and sentenced to life at the Palace of Justice, Pretoria. Robben Island is an island in Table Bay, 6.9 kilometres (4.3 mi) west of the coast of Bloubergstrand, Cape Town, South Africa. The name is Dutch for "seal island." Robben Island is roughly oval in shape, 3.3 km (2.1 mi) long north-south, and 1.9 km (1.2 mi) wide, with an area of 5.08 km2 (1.96 sq mi). It is flat and only a few metres above sea level, as a result of an ancient erosion event. 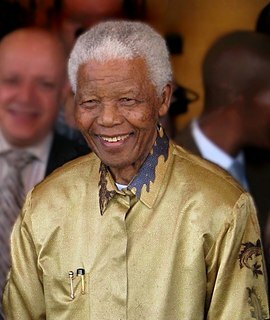 Nobel Laureate and former President of South Africa Nelson Mandela was imprisoned there for 18 of the 27 years he served behind bars before the fall of apartheid. To date, three former inmates of Robben Island have gone on to become President of South Africa: Nelson Mandela, Kgalema Motlanthe, and Jacob Zuma. After his release from prison in October 1989, he was elected to the ANC national executive and the South African Communist Party central committee. He became national chairperson of the SACP in 1995. In January 1994 he was chosen as the ANC's nominee as Premier of the Eastern Cape, and in May 1994 he was elected to that post. He helped to establish the house of traditional leaders. He then became the High Commissioner to Uganda and Rwanda, until he retired in 2001. In April 2001 he released a book of his memoirs, narrated by him and researched and compiled by Thembeka Mafumadi. He was chairperson of a black economic empowerment consortium involved in the Coega port project, but suffered a stroke on 19 July 2003, recovering quickly. Rwanda, officially the Republic of Rwanda, is a country in Central and East Africa and one of the smallest countries on the African mainland. Located a few degrees south of the Equator, Rwanda is bordered by Uganda, Tanzania, Burundi and the Democratic Republic of the Congo. 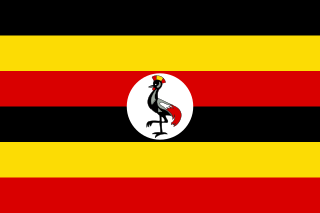 Rwanda is in the African Great Lakes region and is highly elevated; its geography is dominated by mountains in the west and savanna to the east, with numerous lakes throughout the country. The climate is temperate to subtropical, with two rainy seasons and two dry seasons each year. In 2004, Mhlaba was diagnosed with advanced liver cancer, and in December doctors discharged him from a private clinic saying there was nothing they could do for him. On 20 February 2005 he died in hospital. Mhlaba is survived by his wife Dideka Heliso, three sons and five daughters. Mhlaba is seen as a stalwart member of both the ANC and the SACP. He was recognised with the Isitwalandwe Medal in 1992 for his role in the liberation struggle, and the Moses Kotane Award in 2002 for his contribution to the SACP. The Nkonkobe Local Municipality which includes Alice and Mhlaba's hometown Fort Beaufort was renamed the Raymond Mhlaba Local Municipality and Andries Pretorius street, The R30 in Bloemfontein was renamed after Raymond Mhlaba to honour him. Walter Max Ulyate Sisulu was a South African anti-apartheid activist and member of the African National Congress (ANC), serving at times as Secretary-General and Deputy President of the organization. He was jailed at Robben Island, where he served more than 25 years' imprisonment. Govan Archibald Mvuyelwa Mbeki was a South African politician and son of Chief Sikelewu Mbeki and Johanna Mahala and also the father of the former South African president Thabo Mbeki and political economist Moeletsi Mbeki. He was a leader of the South African Communist Party and the African National Congress. After the Rivonia Trial, he was imprisoned (1963–1987) on charges of terrorism and treason, together with Nelson Mandela, Walter Sisulu, Raymond Mhlaba, Ahmed Kathrada and other eminent ANC leaders, for their role in the ANC's armed wing, Umkhonto we Sizwe (MK). He was sometimes mentioned by his nickname "Oom Gov". Abraham Louis Fischer, commonly known as Bram Fischer, was a South African lawyer of Afrikaner descent, notable for anti-apartheid activism and for the legal defence of anti-apartheid figures, including Nelson Mandela at the Rivonia Trial. Following the trial he was himself put on trial accused of furthering communism. He was sentenced to life imprisonment, and diagnosed with cancer while in prison. The South African Prisons Act was extended to include his brother's house in Bloemfontein where he died two months later. Joe Slovo was a South African politician, an opponent of the apartheid system. A Marxist-Leninist, he was a long-time leader and theorist in the South African Communist Party (SACP), a leading member of the African National Congress (ANC), and a commander of the ANC's military wing Umkhonto we Sizwe (MK). Elias Mathope Motsoaledi was a South African anti-apartheid activist and one of the eight men sentenced to life imprisonment at the Rivonia Trial in 1963. The Elias Motsoaledi Local Municipality in Limpopo province was named for him. 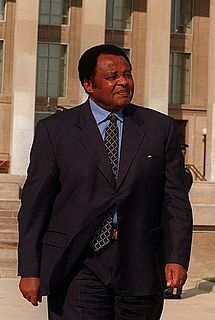 Johannes "Joe" Modise was a South African political figure. He helped to found Umkhonto we Sizwe, the military wing of the African National Congress, and was its longest serving Commander in Chief, deputised at different points in time by Joe Slovo and Chris Hani. Modise headed MK for a 25-year period, from 1965 to 1990. He served as South Africa's first black Minister of Defence from 1994 to 1999 and led the formation of the post-independence defence force. Prisons in South Africa are run by the Department of Correctional Services. According to the ministry, there are approximately 34,000 employees of the department running 240 prisons. In those prisons are nearly 156,000 inmates as of August 2013. The prisons include minimum, medium and maximum security facilities. Since 2012, the Minister of Correctional Services has been S'bu Ndebele. Robert Harold Lundie "Jock" Strachan is a white South African writer and anti-apartheid activist. He flew for the South African Air Force during the Second World War, trained as an artist, then became Umkhonto we Sizwe's first explosives expert. He was imprisoned for sabotage, and after his release served another sentence for telling a journalist about poor prison conditions. He has written two semi-autobiographical books, and completed the Comrades Marathon twice, winning a medal once. He has been married twice and has two children. Wilton Zimasile Mkwayi was born on 17 December 1923 in Middledrift, Eastern Cape, and died on 24 July 2004. He was an African National Congress veteran and one of the first six members of Umkonto weSizwe to be sent for military training. Jafta Kgalabi Masemola, also known as "The Tiger of Azania" and "Bra Jeff" was a South African anti-apartheid activist, teacher, and founder of the armed wing of the Pan Africanist Congress (PAC). He spent 27 years in South African prison during the apartheid era in South Africa, and was released in October 1990, shortly before the legalization of the PAC and the African National Congress by F. W. de Klerk. He served the longest sentence of any political prisoner in Robben Island prison in South Africa. Sonia Bunting, OLS was a South African journalist, and a political and anti-apartheid activist. After being charged with treason and imprisoned, being detained a second time, and barred from publishing, she and her husband went into exile in London, where she joined the Anti-Apartheid Movement (AAM) and organised the World Campaign for the Release of South African Political Prisoners. When the African National Congress (ANC) ban was lifted in 1991, she returned to South Africa where she was involved in political activism until her death in 2001. She was posthumously honored by the government of South Africa with the Order of Luthuli in Silver in 2010. Maximum Security Prison is an inactive prison at Robben Island in Table Bay, 6.9 kilometers west of the coast of Bloubergstrand, Cape Town, South Africa. It was prominent because of Nobel Laureate and former President of South Africa Nelson Mandela was imprisoned there for 18 of the 27 years he served behind bars before the fall of apartheid. After that, three former inmates of this prison Nelson Mandela, Kgalema Motlanthe, and Jacob Zuma have gone on to become President of South Africa. 1 2 3 4 5 "Raymond Mhlaba Biography". Biography J Rank. Retrieved 24 August 2017. 1 2 3 Meldrum, Andrew. "Raymond Mhlaba". Mail & Guardian. Retrieved 9 June 2017.